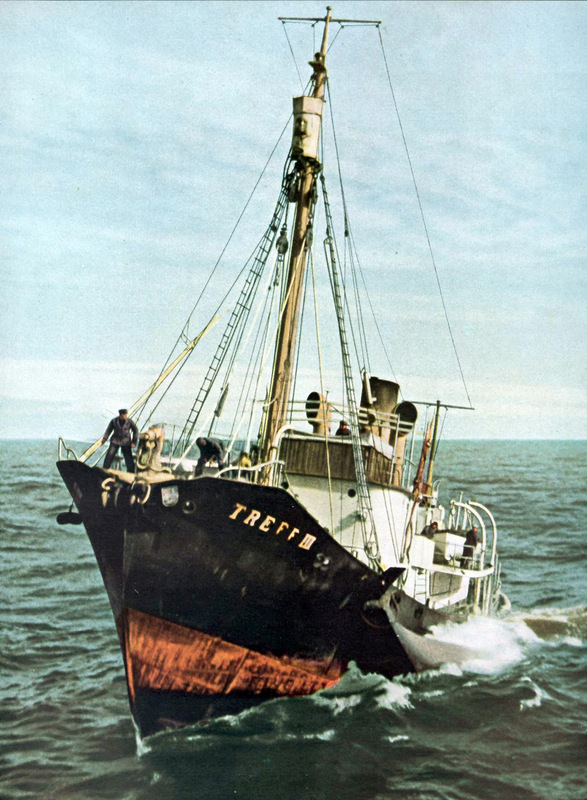 A catcher boat in Antarctica returning to the factory ship with its catch. Catchers would often operate some considerable distance, maybe one or two days sailing from the factory ship. Once a whale had been caught and killed it would be marked with a buoy, the catcher would then go to find another, when several had been marked in this manner either the catcher would go and collect them up and take them back to the factory ship, or sometimes a separate boat would be used for the purpose of collecting and taking back the catch to be processed so that the catchers could continue their job. Several characteristics of catcher boats can be seen in this picture. The high swept bows with of course the gun platform and harpoon gun at the front cut-away portion. The gunners bridge (sometimes called a flying bridge) can be made out leading from the wheelhouse to the gun platform and a small crow's nest atop the main mast where a (usually junior) member of the crew would sit to scan the surrounding seas for signs of whales. At the beginning of the season in particular a bounty would often be offered to these boys in the crow's nest for being the first to spot a whale. There are a number of other features of the catcher boat that are peculiar to this kind of vessel that cannot be seen, these are the mechanisms by which the forces exerted by the capture of a panicked whale weighing maybe a hundred tons or more on the end of a rope are dissipated. As every fisherman by rod and line knows, it is the flexibility of the rod that in part gives it its strength, if the rod were rigid, the line inelastic and there no means of allowing the line to pay out, then rod and / or line would snap when a large fish were caught. The same principles apply to catching the great whales by harpoon gun. When Svend Foyn and others were trying out explosively fired and exploding harpoons, they found that the whale was often lost due to a snapped line. Soon a system was put into place whereby there were means of playing the line out against a slowly applied brake, but most importantly, there was some means of putting some "give" into the system the equivalent of the springiness of the fishing rod. The rope from the harpoon passed through a mechanism called an "accumulator" that also involved a powerful spring housed below the deck before passing to the winch that would eventually haul the whale along side.